Annenberg Classroom (www.AnnenbergClassroom.org), a civics education resource for high school social studies teachers and students offered by APPC’s Leonore Annenberg Institute for Civics, has been named a 2011 Clarion Award winner in the online media category. 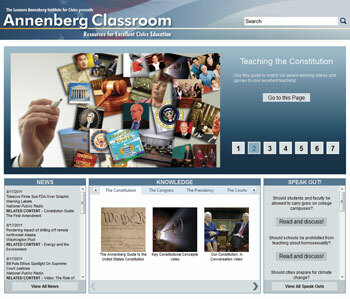 The Annenberg Classroom website houses APPC’s award-winning, comprehensive multimedia curriculum on the Constitution – which includes videos, books, interactive timelines and games, podcasts, and more – and connects it with daily civics news and related “Speak Out” pieces designed to encourage in-class and online student deliberation and discussion. The Clarion Award was established by the Association for Women in Communications to recognize excellence in communication fields. APPC’s FactCheck.org is a previous Clarion winner, most recently for its coverage of the 2008 presidential election.